This year’s Peachtree Road Race in Atlanta, Georgia had the potential to be different from recent years. In light of the Boston Marathon bombing there would be a greater police presence for this race (the largest 10K in the United States). Mother Nature was also expected to change the race as the forecast called for a 100% chance of rain. How did it all turn out? There was rain for the wheelchair race and for the 7:30 elite starters, but by the time the rest of us queued up, the rain had stopped and we were treated with overcast skies for the entirety of the race and temperatures in the low 70s. As for the police presence? I wouldn’t have known they were there had it not been for the news coverage I saw afterwards. 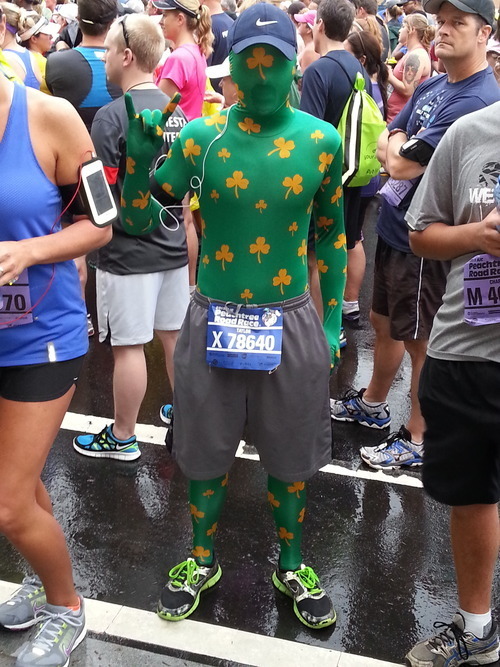 Pre-race was the same as it’s ever been, people lining up at the Marta stations, folks in costumes and beer. I’ve never understood how these folks can do it but the beer drinkers will not be stopped. Holy water was also sprinkled by a catholic priest right before he ascent to cardiac hill (I get it every year), the street apostles warned us that the end was near and there were some folks politicking against using tax money for a new stadium. All par for the course. Live music along the course was more sparse than usual, I’m assuming because wet conditions were expected, however the radio stations were in full force. All runners and walkers were treated to cheering spectators along the course, though fewer in number this year. Anybody who participates in races, knows what the finish looks like. A full on SPRINT. Folks who may have walked the entire course turn into Usain Bolt at the end. I never stop chuckling at this. 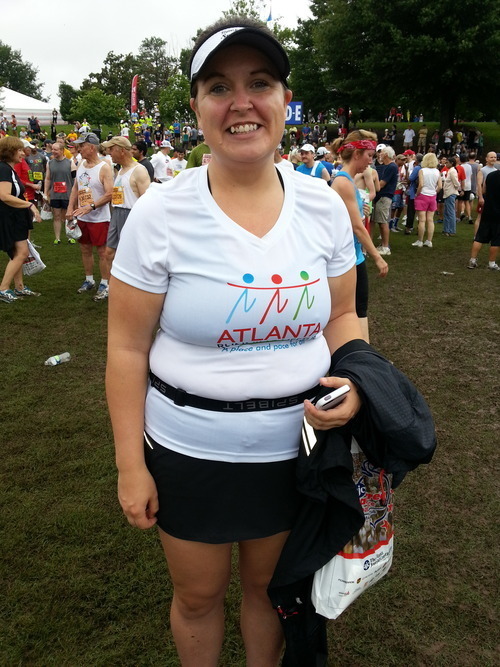 Once in Piedmont Park, we all trudged through the mud to get our t-shirts, drinks and snacks. On my way out I stopped at the medical tent, for good measure this year as I experienced no problems (except for a hip thing which is a nagging injury), there was only one person in the tent while I was there and my blood sugar and pressure were A-OK. New reports indicated that one person suffered cardiac arrest I hope they’re ok.
As is custom I usually stop some random person to take my picture, to show the aftermath. This year that random person was Loren, who was really nice. 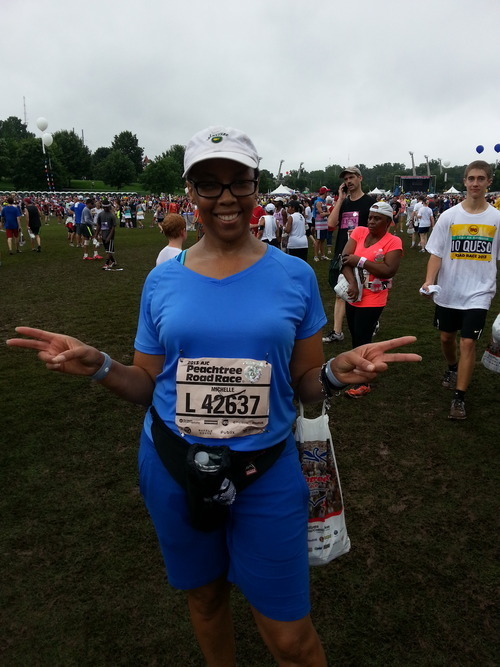 She had run multiple Peachtrees and shared with me that she’d lost over 70 pounds running. GO LOREN! Thanks for humoring me but mostly for sharing your victory with me. Overall this year’s Peachtree was enjoyable, relaxing almost. Not having to worry about the effects of heat and humidity were a relief for this runner and I would imagine the same for many more. As I’ve said the last few years, this is my LAST one. Let’s see if I stick to that when registration begins in March 2014 and sign up for #15. Until next time see you on the trail (or the road). 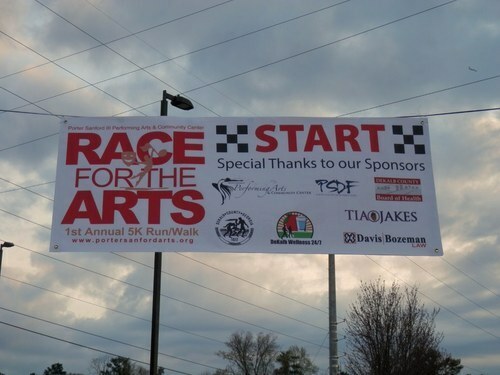 54 degrees and cloudy, a perfect day for the inaugural of the Race for The Arts 5K Run/Walk benefiting the Porter Sanford III Performing Arts and Community Center in Decatur, Georgia. The Center sponsors many events from stage plays, musical performances, dance and programs specifically directed towards youth and seniors. I’ve attended several events there over the last few years and have always been pleased with the programming, facilities and event staff. I arrived at about 7:30 AM for an 8:00 AM start which was perfect for this race. Upon arrival at the registration area, I was greeted by cheerful volunteers and a DJ who was rocking Justin Timberlake’s Suit and Tie. Runners and walkers in the registration area mingled, met up with friends, and teammates and of danced to the music. 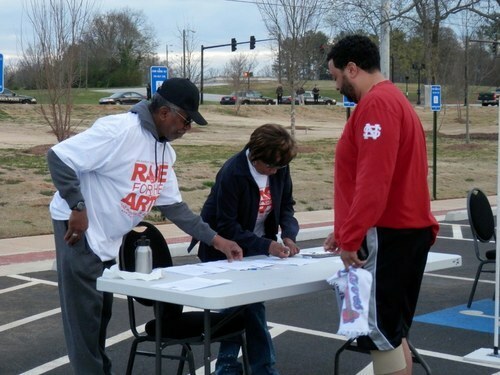 Shortly before the 8:00 AM start time race participants were rounded up to hear remarks from the Center’s Executive Director David Manuel and Dekalb County Commissioner Larry Johnson, whose district the Center resides in. After remarks we had great warm-up leader by dancer/choreographer Stepp Stewart, who had great energy and got the crowd pumped up. Following the warm-up we queued up in the start chute, got the signal and hit the road. The course was an out and back with some long hills. From the parking lot, we made a right, proceeded downhill on Rainbow Dr with an immediate uphill and made a right onto Columbia Dr. 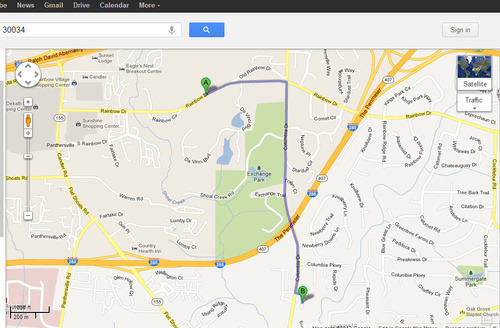 The course crossed over I-285, passed Exchange Park, with a turnaround (from my guess) near Springside Run. The good and the bad about an out and back is that you know what to expect, which in this case was the long up and downhills. The same ones we just ran, we had to run them again on the way back. My team was spread out along the course and I ended up running with a lady in an orange shirt. I didn’t get her name but she was a great pacer and helped me to likely my fastest 5K time ever. There were 3 individuals responsible for time and placement. One running the clock and two determining the finishing place by race number. 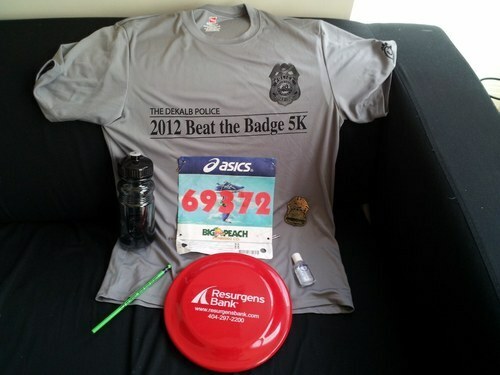 All finishers received a shirt, assorted fruit and water and all the typical goodie bag stuff you get these races. The Diabetes Association was one of the vendors on site and was conducting glucose testing, which is really cool. Of course there was more partying and an award ceremony. 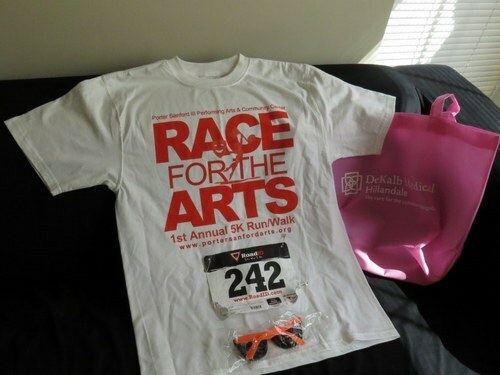 For an inaugural event the Race for the Arts was a success. The event was organized, started in a timely manner, the event volunteers were cheerful and helpful and the warm-up was probably one of the most fun I’ve ever done. It was announced that there would be another Race for the Arts in the fall and I’d definitely recommend it for those who want a bit of a challenge at a shorter distance. In terms of improvements I only saw two things that could be tightened up: 1)the course – I saw two cars drive through as the race was taking place, which could be remedied with cones, additional officers and or volunteers and; 2) the finish – additional volunteers or one volunteer with a megaphone may be needed to direct people through the finish line chute, to make sure their placement and time is accurate. With these small adjustments, this could be a top notch event in the area. For more information about the Center, please visit their website. In the 1970s public school children were subjected to something called the presidential physical fitness test. It was a test mostly of strength. What I remember of the test were three events “the hang” in which you hung from a chin up bar and were timed (for girls), pull-ups for boys, a timed sit up test and a 50 yard dash. During my final year of elementary school a one mile run was added to the tests. 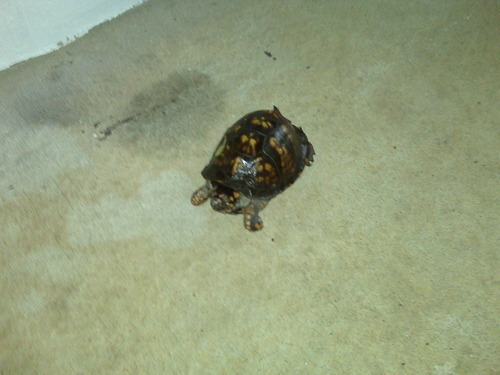 It was in this mile back in sixth grade, in which the turtle was born. I don’t remember the time exactly but know that I completed that mile in around 12 minutes. We had to do timed miles again in high school P.E., I didn’t get any faster I continued that 12 minute pace. When I started running with my dad to maintain my girlish figure, he never timed me. He was too busy lapping me and it was fine. Years after, following undergrad and grad school I always timed how long I ran but never did any calculations on minutes per mile because I really didn’t care about it. I KNEW I was slow. I just dug the rush and the scenery on the outdoor runs. Then a funny thing happened. After moving to Atlanta and continuing to run I decided to enter my first race in 1995. I’m pretty sure I’ve spoken of it here before but as a refresher, the race was the Peachtree Road Race a 10K slog from Buckhhead that ends at Piedmont Park. When training for this race, time became important. I did all the recommended training, long runs, hill repeats, intervals on the track. I was properly geared up as well, but my time still averaged to around 12 minutes per mile for that first race. The second one was just under 12 and I’ve run many more races between the 5K and 10K distances since then with a few sub 12 but the majority 12 minute miles or slower, sometimes much slower because by 2004 I was walking. After a four year hiatus I returned to running in 2008. In the last two years I reached turtle-form clocking in the 12s again. Having come back from a complete stoppage to where I am now gave me the crazy idea that maybe I could get faster. I started increasing my training, changing my diet and beating on myself for every 12+ minute mile clocked of which the majority of them are. Then it hit me. It’s time to OWN THE TURTLE. At the age of 46 the chances of me getting faster are NONE. My time is true to my genetics. I’m not a flyweight and when I was I still wasn’t fast. Fretting over time began to take away from why I really run now and that’s to ease my mind. Sure fitness is important, especially at my age and with the health challenges that I already have. Yet the biggest thing I get from running is peace of mind. The mind that is fuzzy at the beginning of a run, is at peace by the end and that is more important to me at this point of my life than anything else. My first Run the Reagan was going to be cold. A good thing for runners especially old broads prone to hot flashes at any moment. Standing and waiting to start the race is really the only hard part about cold weather racing. 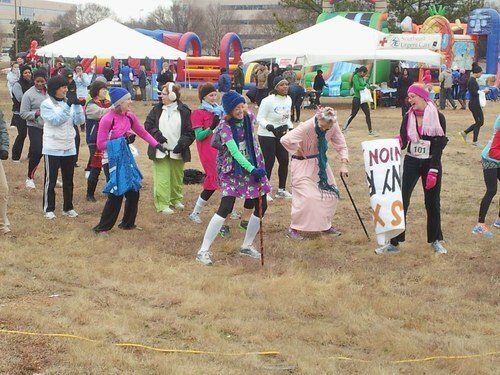 Race volunteers however helped us stay warm by encouraging us to dance to the music. In fact upon arrival, runners and the emcee were doing The Wobble. 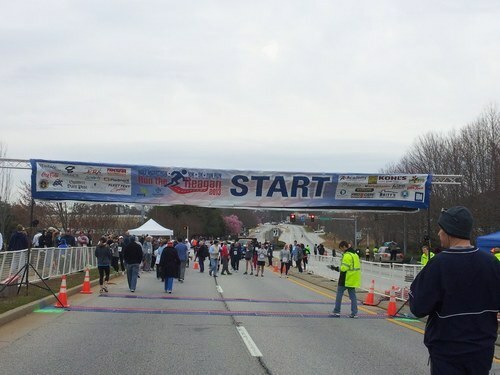 There were four races for Run The Reagan, a half Marathon, 10k, 5k and 1 mile fun run. Here’s how the 10k went down. As we waited to start a strong wind gust took down the start line sign-age, bringing audible gasps and laughs from the crowd. Adept and ready volunteers were right on the spot, getting the sign-age back up promptly without interfering with the start time. At 9:15 am, 15 minutes after the half Marathon, we took off. Run the Reagan is a well oiled machine. The location is great and the course is challenging without being killer. The time of year is favorable for PRs and the volunteer staff, especially the young folks, were energetic, knowledgeable and efficient. As such, I highly recommend this race as good start to your outdoor running season here in the metro. For more information on Run the Reagan please visit their website. For more of my photos see this Google+ album. 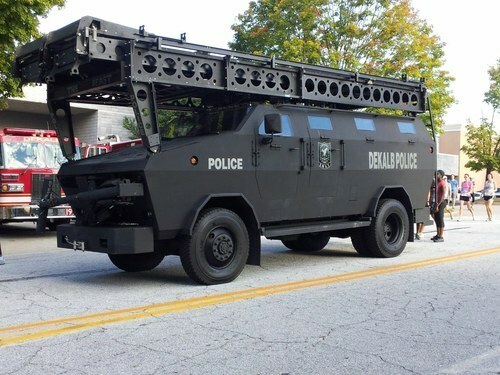 Not exactly crisp, but comfortable were the conditions for the Dekalb Police Alliance Beat the Badge 5K in Tucker Georgia on Saturday. Temperatures in the 60s were a welcome relief for this runner who struggles mightily with heat and humidity that can run well into September. Even if it had been one a hot one, all participants were in good hands. Sponsored by the Dekalb Police Alliance there was a good presence of public safety persons (police, fire and civilian) as well as a few current and former elected officials. On the course there were lots of running pairs, moms and daughter, dads and daughter and fair amount of teens and tweens in the race. What was atypical of this race was that there were not many of the “gung-ho running for a PR” racers, you know the ones who do all that running before during and after the race. These folks just were not there, which is suprising because the race is an official Peachtree Road Race qualifier. In terms of sheer numbers, I’m not really sure how many persons participated in the race but I’d guess in the low hundreds, which is really ideal as there was no congestion in the race start and finish areas, nor were there there any issues exiting the parking areas. 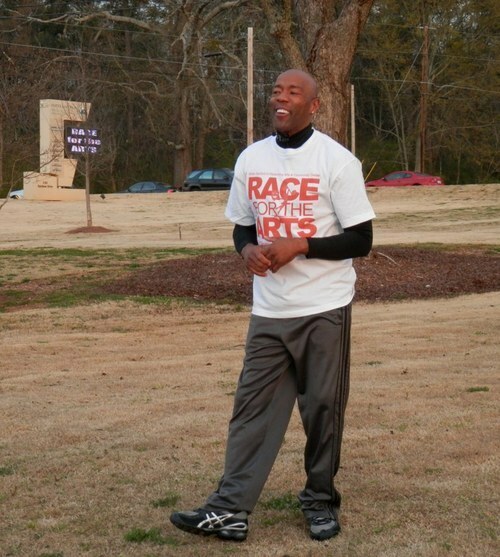 The course started and ended on West Exchange Place in front of the Dekalb Police/Fire Rescue Headquarters. The course wound past LA Fitness and turned left on Northlake Parkway, which meant the beginning was pretty much uphill. Proceeding uphill and crossing over LaVista Road, the course turned left onto the continuation of Northlake Parkway which was nice and flat. Crossing I-285 the runners and walkers proceeded downhill to Henderson Mill, made a U-Turn at Henderson Mill and Northlake Parkway and headed back, hitting both the 1 and two mile marks behind Northlake Mall. Making the climb from behind the mall back to the topside at Northlake Parkway and LaVista, it really was “downhill from here” as spectators and volunteers always tell you. For an out and back course, this one was nice. The hills were manageable and again, the mild temperatures, friendly officers and sprinkling of volunteers along the route made the running the course pleasurable. Centered at the Dekalb Police/Fire Rescue headquarters, there were plenty of shiny vehicles with flashing lights to view, which were interesting for both children and adults alike. 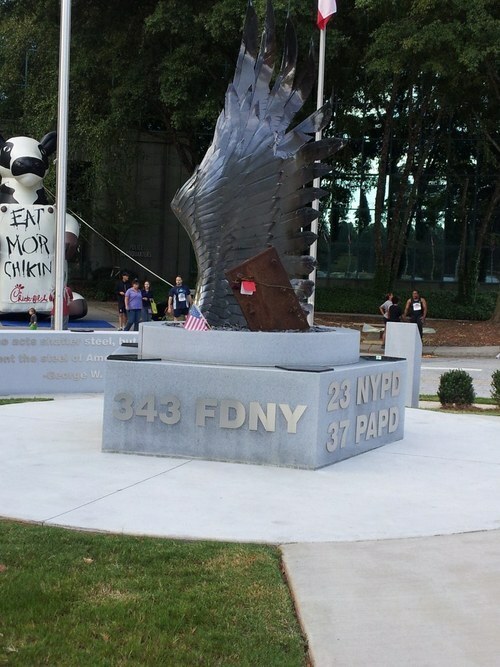 Of particular note in front of the headquarters was a really beautiful 9/11 Memorial. Both before and after the race many participants spent time viewing and photographing the memorial. Post race festivities included activities for children, sponsor booths to pick up additional goodies for your goodie bag and music. The really big deal for me was that they had COLD water and sports drinks. Many races I’ve participated in give you a bottled water straight from the case. In GA in September, it’s still warm so that cold water was much appreciated. There was also plenty of food for hungry finishers. 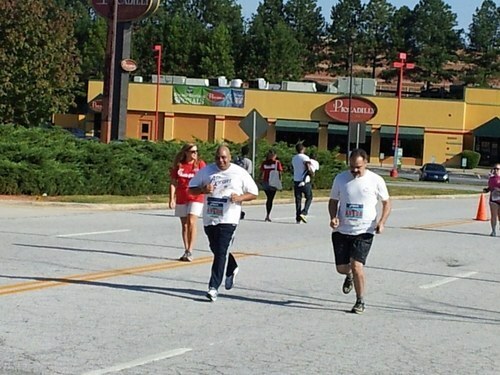 The Dekalb Police Alliance Beat the Badge 5K is a perfect fall running event. 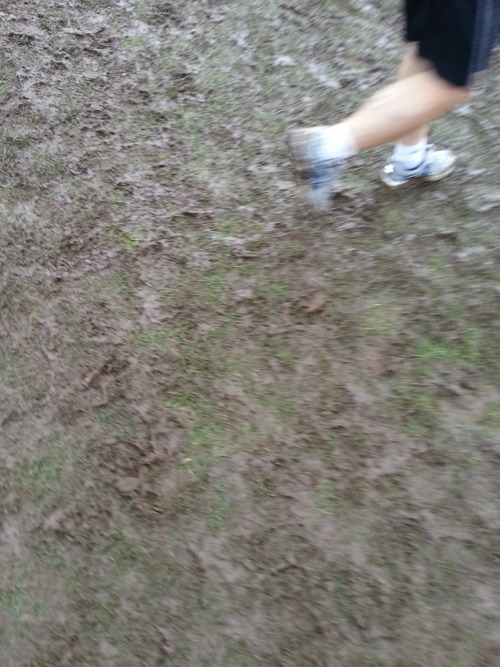 The size is comfortable, the course is just challenging enough and the race is family friendly. If you’re looking for a good September race, that is convenient, smaller and fun, this is a good race to enter. Look familiar? Stay tuned for details. I didn’t sleep much last night because frankly I was excited. This is my first race of the year, The Pensacola Double Bridge Run. First race outside of GA. First race over water. A lot of firsts. I woke up with no alarm and wasn’t a bit tired. Went outside to check the weather. Cool and windy, really cold because of he wind. However I’m pretty well prepped with my $5 windbreaker and high tech long sleeve shirt on top, thermals and yoga pants on the bottom, bandanna, baseball cap, hood and scarf on my head. I skipped gloves, knowing that at some point my hands would be sweaty and I would have to stuff them in my pockets later. The race organizers provided bus transportation from the finish line to the start, which is GENIUS. As a bonus, the buses were a two minute walk from my hotel door so there were no parking hassles or trying to figure out how to get anywhere, which is a relief when you’re somewhere you haven’t been before and may already have the jitters because of the race. I boarded one of the buses and sat in front of two geared up Steelers fans. We talked football, running (all of us were in the 5K and would not DARE try the 15) and made it to the start at Gulf Breeze High School for the hour wait. That was a COLD hour, however conversing with all my other frozen comrades made it fun. I spoke with a Marine brother (whose picture I didn’t take because the conversation was too funny to interrupt with photos). I told him they were a hearty bunch, there were only two who had on hats the rest of the men had low hair or no hair at all and they didn’t look cold at all. There were several female Marines as well, sans hats. I asked the brother whether the Marines do the race every year and he indicated that they do but this was his first one (he was in good shape too I noticed him sprinting to take photos when we we were climbing the bridge). I also asked him if race participation was voluntary he said they were ”voluntold” I cracked up. They represented well. About a half hour later the Navy showed up. They marched in and pretty much stuck to themselves. Then there was the POD crew. A bunch of us huddled together inside of one of those PODS storage containers in order to keep warm. Younger, older but overwhelmingly female we had a good time. I met a group of ladies who were from all over Florida and Georgia. One of them explained to me that they all decided to come and run and walk with her niece and they were all in good spirits. 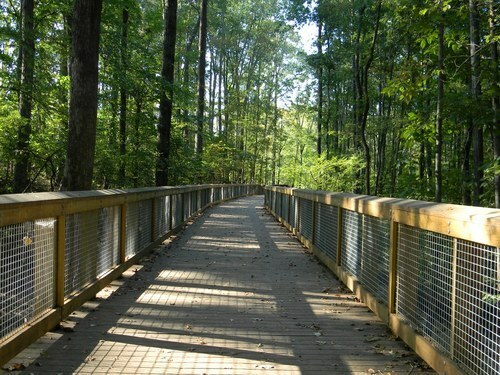 The “Double Bridge” portion only applies to the 15K runners. They cross both the Pensacola Bay Bridge and the Bob Sikes Bridge to get to the finish. Us more fortunate, more whimpy or those with better sense 🙂 in the 5K cross only the Bob Sikes Bridge. For the 5K we enjoyed a gun start and no mad dash, the runners and walkers were orderly and many of them were wearing EAR BUDS. We took a few turns, on the streets then headed for the Bob Sikes Bridge to cross Santa Rosa Sound. What looked like a monster by car was absolutely frightful on foot. What’s funny is that I don’t remember even breathing that hard climbing the hill, nor do I recall any pain. The cadence of the Marines and subsequently the Navy (who all passed me on the bridge) made me forget what I was doing. Next thing you know we’re all on the other side of the bridge heading to the finish line. One big hill, otherwise this course was not difficult. Overcast, cool weather certainly was a blessing that made the trek across the bridge much more manageable. Once I crossed the finish line I checked my time, a PR for a turtle like me so I was well pleased. I didn’t hang around for the post race party, which I hear is lively. I’d already had my party, right there on the race course, watching and listening and of course running. P.S. EAR BUDS is capitalized because I don’t understand how anyone could run or walk in a race with them on. I mean there’s so much to see and hear. Ear buds on a treadmill — sure, treadmills are a run to nowhere, but ear buds in a race, boggles my mind. On July 4, 2010 50,043 folks and I ran and walked down Peachtree to Piedmont Park in the 40thPeachtree Road Race in Atlanta, GA. Always held on the 4th of July rain or shine, folks have been lacing up since 1970. This year I completed my 12th and it was just as special as all others. This year I got a little more serious about the training. I figured lighter equals faster so I worked on my diet and got started building up base miles a bit earlier. I also made sure to stick to the regimen regardless of any distractions, outside/inside, physical and mental and trust me there were plenty. I don’t follow any specific program or anything, just one that works best for me. Knowing that I’ll not be able to repeat any of my times from the mid 90s when I first started doing it, the goal was to finish faster than last year – that goal was attained. Being in a late time group (slow runners, walkers and folks who didn’t turn in times from previous 10ks) my schedule is always the same, get down to Lenox about one hour before my time group gets to the start line, chill out, talk to the folks around me and start running when they say go. This year the weather was perfect. Having suffered through most of June with 90 degree heat daily and high humidity, this morning felt more like May, trust me I was THANKFUL. The only glitch was GETTING to Lenox. You must have a BREEZE card to get on Marta (our rail system) all of the machines weren’t working at Doraville, the line was a MILE long and it took nearly an hour from arrival in the lot to boarding the train. Back in the day, prior to the electronic set up, you got a token or placed exact change in the bucket and went right through the turnstiles. That was a BREEZE – the BREEZE card, not so much. This card has been in use the last three years that I participated in the Peachtree Road Race but this year, was a hassle. Once getting to Lenox, for the first time I believe EVER I had to go to the bathroom – the long wait without any sweating took its toll and let me tell you the Port-a-John’s were as nasty as ever but you have to do what you have to do. Did I say that the weather was perfect? 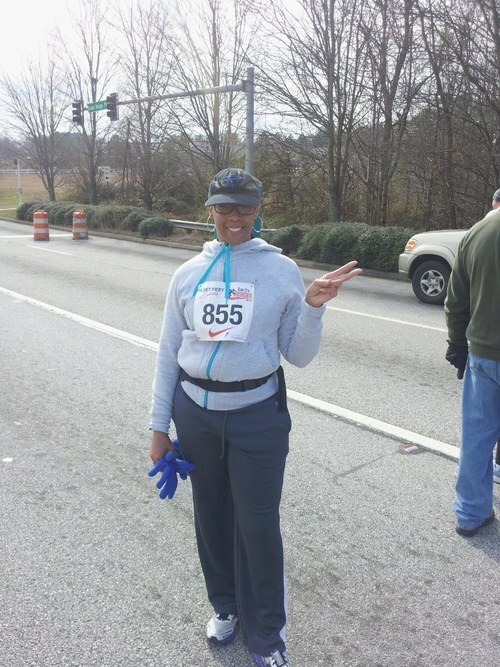 Outside of the long Marta lines, the course was fine, the runners were fine, no one fell out that I know of, there was no ambulance activity. The music was great, the crowds were there to cheer all of us on and give us the energy we need to get up the dreaded Cardiac Hill. For the first time since 1996 I think I was able to run the entire course, no stops, no walking and it felt GOOD! Because I have to. There were four years since my first in 1995 that I didn’t run or walk it for various reasons, all of which in hindsight were lame. I say I have to do it because it gives me a reason to stay on track with my fitness goals. I have to do it because training for it keeps me sane. Many a problem, many a bout of depression as well as many good days have been spent on the road or in the park or on the treadmill running. Besides, the years that I didn’t run Peachtree I felt like something was missing on the 4th of July. As long as I’m upright and above ground, healthy and living in the metro, I’ll be waking up and running down Peachtree Street with all the other nut jobs, talking about long Marta lines, nasty Port-a-Johns and laughing at some of the silly costumes seen in route and of course copping the coveted Peachtree Tee. I love it, wouldn’t trade it for the world and if you’re in the area, I invite you to join me next year for Peachtree 41, my 13th. Registration is in March. In the interest of stretching out, doing something different but in a place that’s somewhat familiar, right after the Peachtree Road Race I signed up for the Macon Labor Day Road Race 10k. I happen to like Macon, it’s easy to get around, laid back and I knew that the experience would be a good one and it didn’t let me down. I couldn’t have thought of a better way to spend the “unofficial end” of summer than to get up, get out and run with other like minded folks. and blew right by me! Which is fine, I’m a tortoise not a hare and we weren’t a mile in, maybe a half mile before we hit a huge hill that runs alongside the designated parking for the race. After that first hill the course was really fantastic. Flat for the most part, and fairly shaded, we ran down Forsyth past residential and business areas. There were no cheering throngs along the route but there were a few folks scattered about to cheer us on and it was much appreciated. The water stations were well stocked and for some DUMB reason I took some water, which I NEVER do but my mouth was dry. I would have been better off swishin’ and spittin’ than drinking because it gave me a fit for the next mile. Then I was alright. Right after the 4th mile was another hill, not as long or steep as the first and the buildings provided great shade so it wasn’t bad at all. At that point the 5k and other 10k finishers were walking back each shouting the familiar refrain “you’re almost there”, I laughed every time I heard it because at the 2nd hill there was still two miles to go. Yet it went by quickly, we took a couple of turns through downtown Macon, near the Sports and Music Halls of Fame and Tubman Museum and I crossed the finished line in Central City Park. Absofreakinglutely! The course is great, its scenic, the runners and walkers are friendly and the race size of 2000 is just right. Park finishes are always good for me, as parks are my very favorite thing. Though I’d like to see more to drink at the finish, the race in its entirety gets a big “thumbs up”. Macon Tracks Running Club, the race sponsors, Macon Police and EMA run a well oiled machine of a race and they send you back to the parking areas via the comfort of air conditioned motor coaches (buses) instead of being packed in light sardines rubbing up on everybody’s sweaty bodies. That is a classy touch and the race shirts are spectacular women’s or men’s fit shirts in technical fabric, the best shirt I’ve ever received from a race. I highly recommend the Macon Labor Day Road race to anyone who loves hitting the road, by foot of course. See additional photos of my race experience here. On July 4, 2011 the 41st running of the Peachtree Road Race had the the largest field of runners/walkers/crazies collected in one place at 60,000 registered and 55,090 finishing. This one was unlike any of the previous 12 I’d participated in, but they never are. All the training was done. I was set to take about 2 minutes off last year’s time. Did the whole hydration thing on Sunday to the point of floating away, simple meals with vegetables, protein and carbs and adequate rest. I was ready as far as my body was concerned. My mental state not so much… Disgusted, disappointed, depressed and dismayed YEAH all the D words but what the hey, it wouldn’t be life if stuff didn’t go wrong, but I digress. When I woke up race morning I was fairly skittish. The temperature but more so the humidity this year was not going to be in our favor. In some of the hot races past, I’ve seen people pass out on the course, toss their cookies and though I didn’t see it, I was on the course a few years back when an otherwise healthy man had a a heart attack and died. So by the time I hit the car I was in full froth, lathered up with anxiety. In fact I almost turned around at Jimmy Carter Blvd because my stomach was really acting in lieu of the turnaround I put on My Favorite Things (John Coltrane, McCoy Tyner et al) and proceeded to Doraville station. I’m a wily veteran, I did some heat training. No PRs (personal records) today, I would slow it down, complete the race and get my shirt. There’s plenty of visual stimulation at Peachtree. At Doraville station, the end/beginning of the Northeast line, it was the usual mayhem. Long lines queued up to get Breeze cards, police directing traffic, folks running late and using all their energy to run for the train or back to the car for forgotten items, families prepping, people telling war stories of Peachtrees past, and the train conductor who always sounds bored to tears to be working on the holiday. Upon arrival at Lenox station and heading to the start waves it gets even better. There are costumes, flags waving, plenty of silly head gear and something that I’ve never really paid much attention too but did this year, folks looking for race numbers. I stopped and talked to one guy, who had a number but whose buddy, a member of the armed services wanted to run with him but didn’t have a number so he was hustling to get one for his friend, which was really cool. I suspect that he got one as well because some of the other folks I saw hustling for numbers ended up on the course with one. There’s a number of radio stations, live bands and people along the route who cheer all of us on. It’s fantastic. I’ve been in the very back before with an 8:50 start and they cheer and play just as hard for the whole 50-60k people. This year’s musical selections included Temperature (Sean Paul), Power in the Blood (of Jesus), Jungle Boogie (Kool and the Gang) and all other manner of genres of music as well as bongos, congas and such. 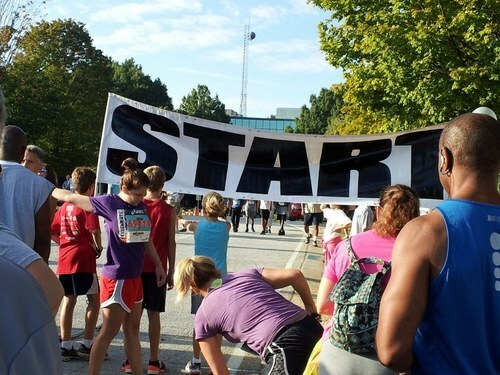 I had a chance to talk to a lady while queued up for the start who also had been running Peachtree for some years and she shared that all though she’s done this numerous times, she still gets nervous this year she even felt sick at one point we laughed together and at each other for the silliness. There’s no way to get around it, the race was an absolute BEAST this year. 75 degrees and 78% humidity dashed all hopes of making my time so I took it easy. By mile 3 (where you climb to Justin’s restaurant and Piedmont Hospital) I was on pace to hit my time, I was feeling good. By mile 4 I’d slowed considerably and considered walking because something just was not right. Even though I had run through all the sprays (including the holy water) I just couldn’t get right. Then that silly thing called EGO kicked in and said hello…. you can run 7 miles, what’s 6.2? What’s your problem? Finish running this thing and get that shirt. 4 to 5 was a struggle. Miles 5 to 6 were a bit better but I just didn’t have the juices going to push me in the last .2 between the photographers and the finish line, I made it though. I was supposed to meet up with some of the Shed fam to take pics after the race and had a little time to kill. I proceeded to pick up the coveted shirt, took some pictures and then it hit me, my HEAD was SPINNING. I said ok, I just need some Powerade, maybe the blood sugar is low or something. So I headed all the way back to the street to get the Powerade and started to head back to get one of those finisher photos. On my way, and after drinking some of the Powerade I felt worse. Turned right back around and went straight to the medical tent, which was next to the Powerade. I have NEVER been to the tent, EVER!!!! They checked my blood sugar, normal, blood pressure fantastic. It was a little bit of heat exhaustion, which made sense because at a certain point before I headed back to the medical tent, I couldn’t hear anything anymore, and I was a bit disoriented. The folks in the medical tent were the BOMB.COM. They got me cooled down with multiple applications of icy towels and regular Powerade (not the 0 cal stuff I was drinking) and eased my nerves. Once I was sufficiently cooled and advised to keep drinking I was released and headed home. Unfortunatley I didn’t get to meet up with the gang, but they were real cool and tried to locate me at the tent (thanks, Alicia, Shauna, Jeff, Dominique). Well it HAD to happen, I mean 13 is supposed to be an unlucky number. I did all I could to make it go wrong in the beginning but it didn’t happen, it never really did. Heat exhaustion doesn’t qualify as a “go wrong” and 13 really didn’t prove really unlucky at all in fact I was fortunate and blessed. First I ran the entire course, finished and got the shirt. Second, the Creator gave me the good sense to know that there was a problem and as such sent me to the tent to help me avoid ending up face first in the grass. Third, they have a bang up group of volunteers in the medical tent who get you back on your feet to make the sojourn home and fourth I got some great friends who had my back and undoubtedly would have found me had I remained in the tent. So #13 is a wrap, it wasn’t the best ever but it was an experience and at the end of the day, it is all about the experience, whether good, bad or in between. You can believe that if I’m on this earth in 2012, I’ll be headed down Peachtree street again with 59,999 of my closest friends.